Hot Water Heating systems are a specialty of Horizon Services. 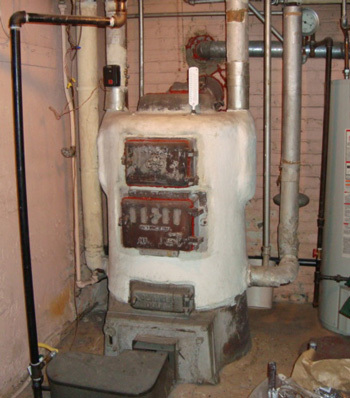 Usually referred to as “Boilers”, these types of systems are not the most common form of heating system in Denver homes, but there are a lot of these systems around, especially in older homes, and are in need of boiler repair. These systems typically utilize either radiators or baseboard heaters (fintube convectors) to distribute heat to the home. This specialty is also called “Hydronic” heating, and the sizing of boilers, distribution piping, components used, amount of baseboard (fintube) needed to properly distribute the heat, are all a part of this specialty. These types of systems are popular due to how quiet they are (when operating correctly), they also tend to not dry out the air in the home as much in the winter months. However this type of system does not facilitate cooling, so alternative systems are needed to cool the home in Denver’s hot summer months. We are experts in the renovation and repair of these older less efficient systems, to modern efficiency and Hydronic piping practices to ensure the systems continue to operate quietly, safely and efficiently. Hot water heating systems are also very good at producing all the domestic hot water you need as well, water heaters that use a “boiler” for producing this hot water are typically referred to as Side-Arm or Indirect Fired Water Heaters. Because this water is heated at the efficiency of the boiler, and the tanks tend to be insulated more than a typical gas heater, hot water created in this manner tends to be more cost effective than most other means. There are also components that can be used to ensure that your domestic hot water needs take priority over any other heating, to ensure there are no issues creating this hot water during the coldest of days when your hot water heating system is really working hard. Some homes also have radiant heating which uses a hot water boiler to distribute hot water through piping installed in the floor, or under the floor, to eliminate the need for and radiators or baseboard heaters. These types of systems can also be set up to melt snow on sidewalks and driveways, although these systems are even more specialized and designed specifically for these applications, and are typically not capable of just being added on to existing systems, without major renovation. If you have one of these systems and have any questions or concerns, about proper operation, service and maintenance or if you are starting to investigate possible replacement options, we would welcome the opportunity to assist you in any way. Please contact us for Denver boiler repair services today.